Last night I carved a Halloween pumpkin for the 1st time, an activity which was a lot of fun. 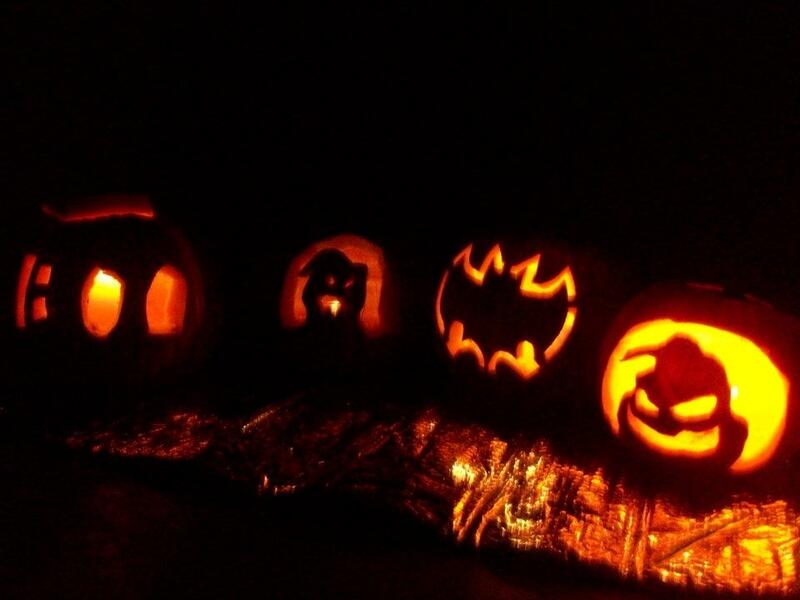 I was down in San Diego for the night with my friends Anna, Lexi, and Alec, and we decided to carve pumpkins. So off we went pumpkin hunting. I had no idea what type of pumpkin to look for or what sort of characteristics it should have, so my friend Anna came to the rescue, explaining how you wanted a large and rather flat front face. She also warned me not to get too big of a pumpkin because that would mean more scraping and a bigger mess to deal with. We dug through the huge crate of pumpkins until we were each happy that we had found the best pumpkin. Once we got back to the house the kitchen table was cleared, and the four of us began hacking open our pumpkins. After cutting a hole in the top, we began pulling out all the sticky, stringy seeds, then with spoons and a shared ice-cream scooper, we scraped our pumpkins clean. Then all activities stopped, while we surfed online for cool templates. But Lexi didn’t hesitate. She simply began carving: two triangles for ghoulish eyes and off-centered squares for a devilish grin. On the back of her pumpkin, she somehow impressively carved “BOO”. Meanwhile, we remaining pumpkin carvers sorted through stupid, horrible, and ugly templates trying to find the one that jumped out at us. Finally, Anna chose a ghost with an evil smile, Alec found screaming ghost, and I decided on Batman. For me, once I saw the Batman template, it was an easy choice. By no means am I into comics or superheroes, but from my limited knowledge of such, to me Batman is the most awesome. So following my friends’ lead, I sketched the design onto a piece of paper, taped it to my pumpkin, then traced the outline by poking holes into my pumpkin with a knife. I knew my carving had to have an outline to allow light to come through, but I had no idea how to do that and still leave the Batman design intact. Luckily, Lexi saw my confusion and told me to sketch a larger outline and carve out the section between for lighting. And so I did. And it worked. For my first carving, I was impressed – of course. It may be considered a children’s activity, but it was so fun. Then the girls rummaged through the house trying to find candles so we could light our pumpkins. After going through pretty much the whole house we scrounged up four candles and then excitedly headed to the front porch for the lighting ceremony. We turned off the porch light, lit the candles, then stood there admiring our creative cravings. There was nothing fancy, exquisite, or awesome in what we did. It was just four friends having fun while carving pumpkins in San Diego. But for me, it is a great memory. A memory I’ll have in mind if one day I have the opportunity to carve pumpkins with my own children. ← Why Am I Watching Hockey?